Yesterday was Fathers Day, and I’m reflecting on last week…a paramedic from St. Charles County Ambulance District passed away. A memorial service is scheduled for tonight. He had suffered a stroke about a month ago and passed away from complications resulting from that stroke. When I heard of his passing, I was shocked, because I had just seen him on the scene of a medical incident about a month or so ago…what would have been just prior to his stroke. He and I weren’t close friends, in fact we hardly knew each other…except to say we shared a bond through our work. When we first met, he was at the medic base right around the corner from our station…where I started my career and have spent the majority of my now 13 years as a career firefighter. We shared a similar schedule, working 2 out of every 3 shift days together, so we saw each other on scene frequently. I don’t remember the specific story of when or how it came to be that he started calling me “tiny”, but that was him. After the first time he called me that, it is how he referred to me every time we met, even last month…after not having seen each other in close to four years. That incident last month, seeing him for the first time in 4 years, and saying “hey, tiny!” is perhaps why it was such a shock to hear of his passing…and what has prompted this note. He was in early 50’s. I’m about 5 weeks shy of my 38th birthday as of this writing, so we were maybe 15 years apart in age. It’s certainly not unheard of for a 50 year old man in a high-stress career to die of a stroke, but death has a way of meaning so much more when it’s someone we know…even if only through the common bond of career choice. It’s also not unheard of for a guy in his 30’s to die of a stroke, heart attack or any other combination of medical complications. What I’m trying to say is that my time here is short. Shorter than I am prepared. I’m ready for God to rapture us all Home. I rally am. What I’m not ready for is to be called Home prior to the rapture…to leave you and your mother here without me. Yet I work in two high-stress, high-risk careers, and I ain’t getting any younger. I have work to do yet. Lessons to teach you. Wisdom to share with you. Life to grow with you. Now is the time to start sharing all I can here…through these notes, as well as in our daily life. I must kick my efforts into overdrive…ramp it up a notch. My child, you too can face your “difficulty, danger, pain, etc.” and do “what must be done in spite of your fear”. You have that within you, granted to you through the power God. Find your strength in God and face your pain and danger and difficult situations with Him by your side, resting comfortably in the knowledge that whatever the outcome, you did the very best you could, and God will be pleased in you for that and reward you for it. If there is one thing I could say to you before I go…if this were the last note God allowed me to write, I would say this. I love you more than words could ever express. I go weak when I think of you in pain. When I see death, it rips me apart inside to not be able to hold you…to tuck you in at night…to see you and know you’re safe and protected. I love my job and what I do, but I hate being away from you. I hate not being able to tuck you in every night. I hate missing you coming home after school every day. I hate not being at every dinner with you. I hate missing important events in your life. 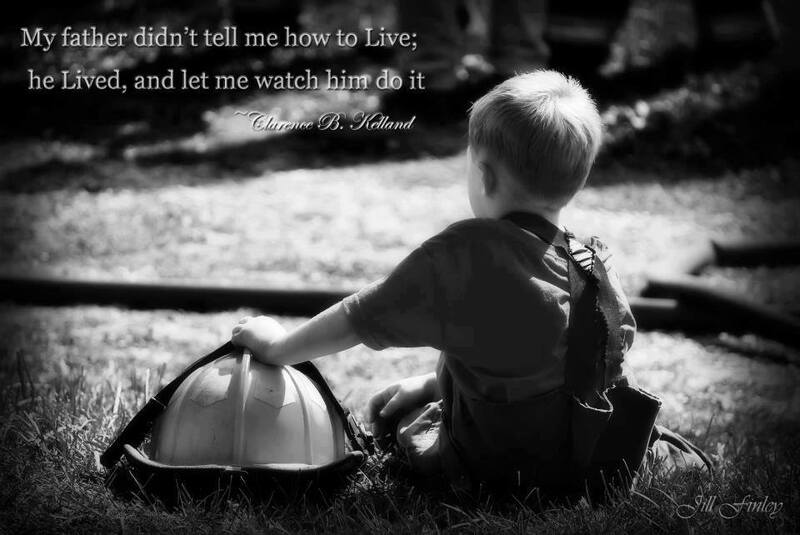 I love what I do, but make no mistake my child. I LOVE YOU MORE! You and your mother have always come before my job. I work to put a roof over your head, blankets on your bed, food on your plates…to provide life’s necessities for you, along with the occasional wants. That is why I am away from you 1/3 of every month. You are the most important thing to me, next to God. I love each of you with so much passion that it hurts to be away from you. It is my prayer and sincere hope that you never go through life thinking this job came first. I want you to remember that spending time with you was a #1 priority for me. Just being with you was something I always cherished. Even the song I wrote to you, My Quiver, references Psalm 127:3-5, which daily reminds me what a blessing you are to me. I certainly don’t get it right all the time. I stumble in my efforts to be the best dad. I try as hard as I can every day to be the best dad I know how. Please forgive me when I let you down and when I disappoint you…and know that you are a #1 priority for me. My mom, your Granny, recently posted on Facebook a quote that a friend of hers used. I don’t know who deserves the credit for this, but I want you to know: “If you are not being treated with the love and respect you deserve, check your ‘price tag’. Perhaps you have marked yourself down. It is you who tell people what you are worth by what you accept. Get off the ‘sale rack’ and get yourself behind the glass case where they keep the ‘valuables’. Bottom line: value yourself more.” You, my child, are a valuable gift from God…made perfect in His image. There is no one else who is living now or who has ever lived…throughout all eternity…that is exactly like you. God chose you for this time and place in the universe. Make the most of it and pursue your dreams with passion. When you stumble and fall, pick yourself up, dust yourself off and continue on, having learned from your past. As long as I am living, I will be here to help you pick yourself back up, and I will be here to celebrate in your successes. I will be by your side for all my days. If I could put some of these words to music they would reflect the words already penned and put to music in the song, Shine Your Light by Robbie Robertson. It’s from the “Ladder 49 soundtrack, and while that my sound cliche’, it is not. Regardless of the movie, I would like to think had the song been written separate from the movie, I would still find the similarities in my own life within its words. The song whose words I try best to model my actions and life after would be “Follow Me“, the praise and worship version. When God calls me into eternity with Him, I will be watching over you. With Jesus by my side. I will be there. Feel for me in the soft breeze. I will be there. Listen for me in the soft whisper on your heart and in your mind. I will be there. Look for me in the brightest star on a cloudless night. I will be there. I will be the light shining in the distant horizon…shining down on you so you can see. I will be there.